This is a fabulous, but simple and gourmet-like dinner. Perfect for the summer because it will not heat up your kitchen too much! Heat the olive oil in skillet and saute the baby bella mushrooms and frozen pearled onions for 4 to 5 minutes. Pour them out into a bowl and set aside. 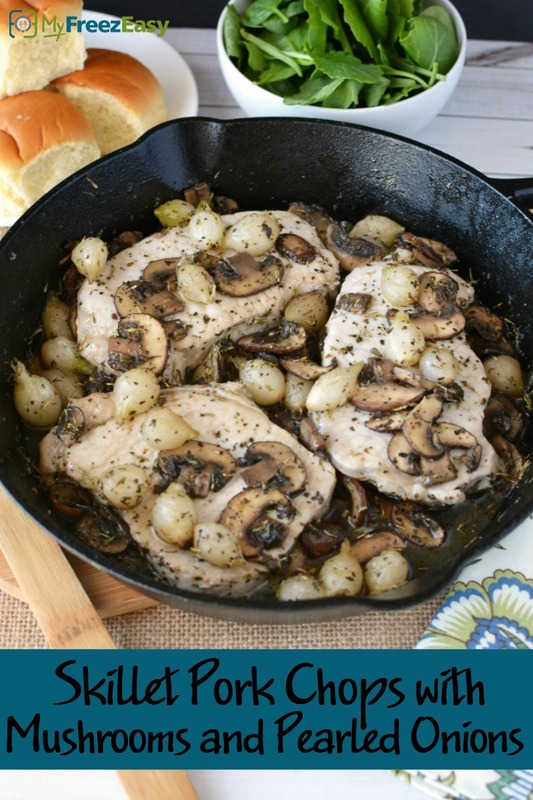 In the same skillet, brown the pork chops for 2 minutes on each side. Add the sauteed mushrooms and pearled onions back into the skillet and add the dried thyme and basil. Stir to combine, reduce heat and simmer for 5 to 8 minutes, or until pork chops are cooked through. 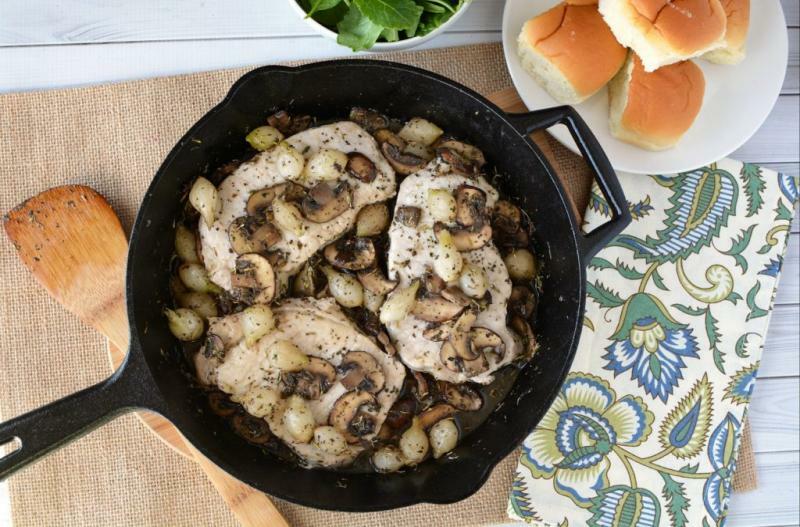 Serve Skillet Pork Chops with Mushrooms and Pearled Onions with salad and dinner rolls. Put baggie in the freezer and freeze up to 6 months in fridge freezer or 12 months in a deep freezer. Thaw in the fridge overnight, or a warm bowl of water for about 20 minutes, before transferring the veggies to a skillet and sauteeing. Remove veggies from pan. Then brown the pork chops on both sides, add the veggies back into the pan, and saute until the pork chops are cooked through. Serve with cauli-rice for Paleo/Whole30 meal. Thaw completely. Saute veggies in the skillet. Remove the veggies, brown pork chops on both sides, and then add the veggies back to skillet. Cook until pork chops are cooked through.